Benji and Bel are playing on the beach when they spot an unusual sea creature. Benji immediately identifies the sea creature as a dugong. The creature replies that she is in fact a beautiful mermaid. Bel is enraputed but Benji is cross - he knows he is right. While the sea creature tries to prove to a sceptical Benji that she is a mermaid he points out all the features which indicate she is a dugong. When he finally refers to her as a sea cow the dugong can stand it no longer, breaks down and cries. Bel is distraught and Benji realises he has gone too far. He apologises for hurting her feelings. The story ends with both Benji and Bel spending the rest of the day playing happily with the dugong until it is time to go home. This is a sensitive story about considering the feelings of others. As well as exploring the power of imaginative play it also touches lightly on the right of the individual to assert their own identity. The illustrations are just gorgeous and add detail to the story, is that a mermaid disappearing as the sun sets? 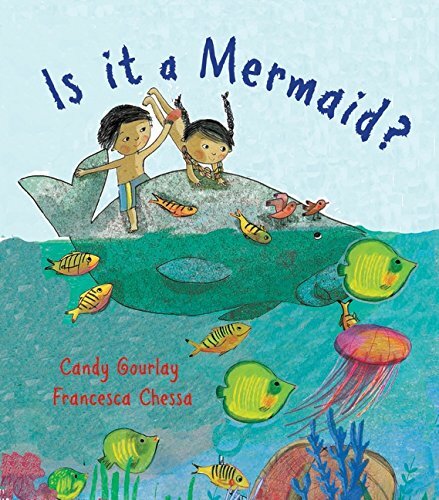 For children intrigued to find out about mermaids in nautical mythology, dugongs and threats to their survival, some interesting information is included at the back of the book.